When playing my Juno 6 (with the Ju-66 mod) for a while, it suddenly starts to behave weird. Sometimes this happens after playing for one hour, sometimes after a few minutes, sometimes it takes 2 or 3 hours. It also happens when i.e. I play for an hour (and everything is working fine) and then let the Juno untouched for 2 hours. It seems it happens completely independent of the play mode and Ju-66 configuration. - why does the soldering bridge not remain once it has been created? A bit confusing. Anyone out there who might help? - are there any diagnosis options I can use? I guess no since there is no interface to get diagnosis information out of the chip? - From the information provided above, does this rather sound like a problem coming from the chip part of the mod or from the filter control or the pitch bend control? I'm asking because I fear I have to de-solder all parts of the mod step by step to isolate the root cause. - Assuming the root cause is the chip: from the information above, is there a certain part of the chip more likely to be the root cause? I'm asking because the soldering points all seem to be when then synth is turned off, so it will be hard to find a solder strap that is appearing "dynamically". If I could locate at least a certain area to look at (i.e. because the pins there control related functionality) that would make life easier. - Any ideas how to find potential solder straps that are none when the synth is turned off? Else than an optical search? first time I hear of such a problem. My guess is that there is a bad solder connection, or a fine crack in trace somewhere. Eventually a connection fails, this could be due to temperature, but maybe also just random (or both). If you see any change it is certainly a mechanical problem. Hard to track down though. 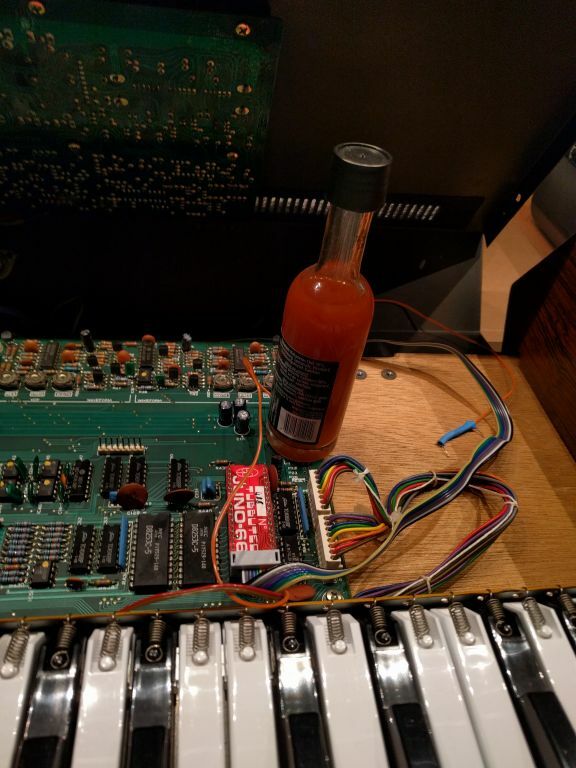 It's of course not entirely impossible, that the Juno-66 is faulty, but I can not think of a way such an issue is created. You could try to perform a firmware reset. And if that does not help perform a firmware update. Bingo. There seems to be a crack somewhere "north" of the socket. I have no idea how this could have happened. Is there any chance to repair such a crack (i mean, once i was able to localize it - although i got no idea how to track it down atm)? Other than to repair, i guess only option is to place some weight at the right position and to hope this will do the trick? Since it needs the least weight to get rid of the malfunctioning at the yellow marked area, i guess it's plausible to locate the issue somewhere in that area. Now if i correctly understand, WR, RD, INT and DB1 to DB7, P20, P23, P26 and RESET are not used by the Juno6- (i think they are Ju-60 specific), may i count them out as potential source? 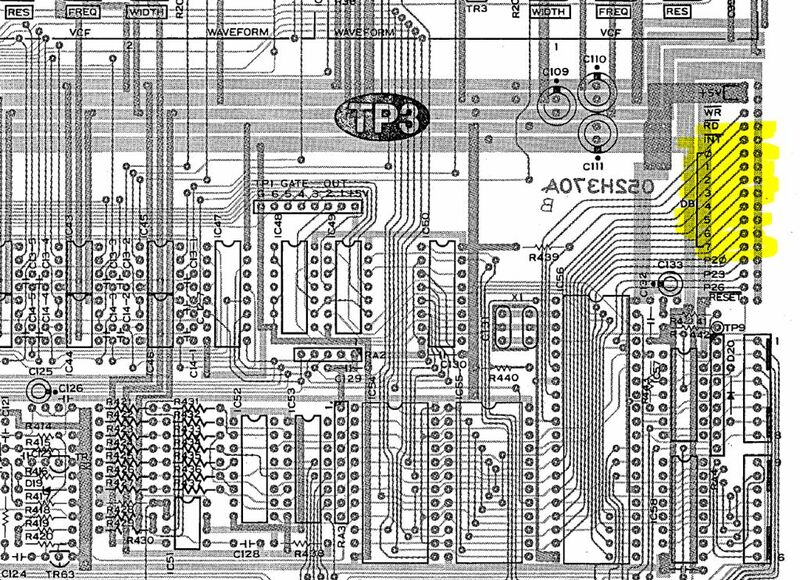 the traces in the yellow area are not used by Juno-66 (they are going to the DCB header). So the problem might be somewhere else.